You should apply for credit as soon as possible so that you get the outcome of your application before the start of semester. This will allow you to add your new courses before week 2, and drop your credited courses before week 5 (census date). Changes to program duration for International Students: As an international student you are required to complete your study within the program duration (ESOS Act 2000) as stated on your electronic Confirmation of Enrolment (eCOE). Thus you are required to maintain a full-time enrolment wherever possible. 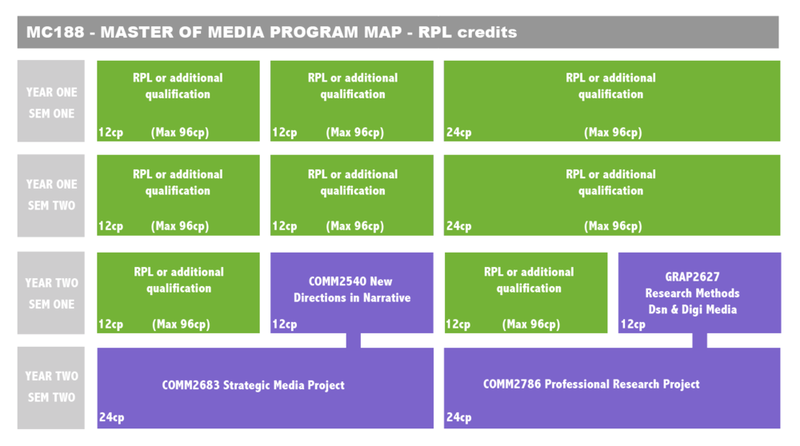 If you are granted credit/RPL for some introductory courses you may be able to replace these with more advanced courses, and this may change your expected program duration. If so, you need to apply for a new student visa with a new expiry date. To do this you need a new Confirmation of Enrolment which you can request using this Confirmation of Enrolment (CoE) Request Form. If you are granted credit/RPL for some introductory courses but you can't replace these with more advanced courses (for instance, it is too late in the semester to enrol), we will complete a Recommendation to Reduce Enrolment Load form on your behalf. 485 Graduate Visa: If you plan to apply for this type of visa after graduation, you should seek advice about how credit/RPL may affect your 2-year study requirement. Have you completed a BA or Grad Cert in Media Production within the last 10 years? If so, you may be eligible for credit of up to 48 points/1 semester (see diagram below with possible BA / Grad Cert credit courses coloured blue). Have you completed a BA(Hons) or Grad Dip in Media Production within the last 10 years? If so, you may be eligible for credit of up to 96 points/2 semesters (see diagram below with possible BA(Hons) / Grad Dip credit courses coloured blue). Application: Sometimes RMIT will assess your eligibility for this type of credit (known as 'masters exemptions') when you apply for the program. If your offer letter contains a credit assessment you still need to apply for this credit via a Credit transfer and RPL application form. Your masters exemptions will then be applied to your student record and you can alter your enrolment accordingly. If you didn’t get this credit but think you should have, email your Academic Advisor (patrick.kelly@rmit.edu.au) and make an appointment to discuss. Upon successful completion of BP221 Bachelor of Communication (Media) at RMIT University you will receive masters exemptions of 48 points. 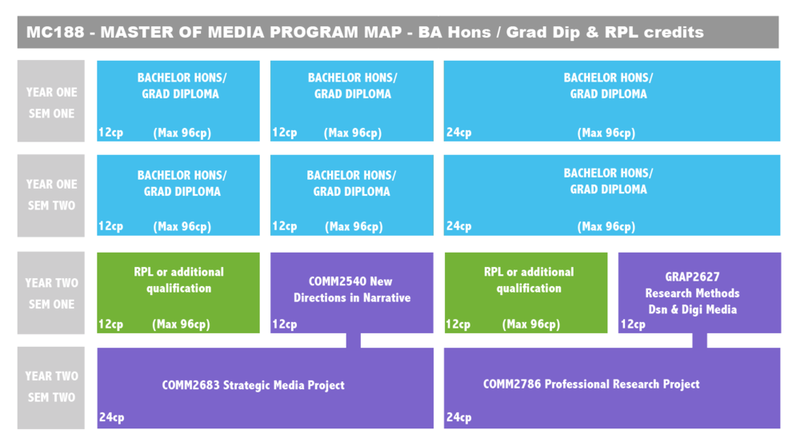 Upon successful completion of GD074 Grad Dip Journalism at RMIT University you will receive a block of specified credit worth 96 points. Course Transcript: Your credited courses will be listed on your academic record as MX (Masters Exemption). To check your academic record and view your credit login to myRMIT, select the link to Enrolment Online, then select Academic History. GD180 Grad Dip Media: If you are granted masters exemptions for MC188 these exemptions cannot be transferred to GD180 Graduate Diploma in Media. International students: find out how this type of credit may affect your visa/s - Course Credit for International Students. 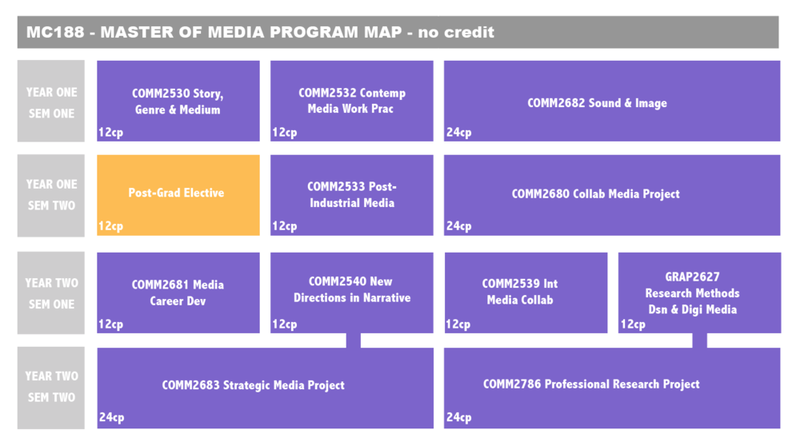 Have you completed Media Production courses as part of a Masters program within the last 10 years? If so, you may be eligible for credit of up to 96 points/2 semesters (see diagram below with possible Masters credit courses coloured blue). Application: This type of credit is called 'specified credit', and you need to apply for it. Start by reading the course descriptions on the Courses page. This will help you determine which course learning outcomes you have already covered in your previous formal study. It is also a good idea to come to one of the Enrolment Information Sessions at the start of semester, to discuss the credit application process. Email the above documents to your Academic Advisor (patrick.kelly@rmit.edu.au) and make an appointment to discuss your application. Course Transcript: If your application is successful, your credited courses will be listed on your academic transcript as EX (Exemption Granted) or BX (Block Exemption). To check your academic record and view your credit login to myRMIT, select the link to Enrolment Online, then select Academic History. Have you gained Media Production skills through work experience within the last 10 years? If so, you may be eligible for credit of up to 96 points/2 semesters (see diagram below with possible RPL credit courses coloured green). Application: This type of credit is called 'recognition of prior learning' (RPL), and you need to apply for it. Start by reading the course descriptions on the Courses page. This will help you determine which course learning outcomes you have already achieved through your work experience. It is also a good idea to come to one of the Enrolment Information Sessions prior to the start of semester, to discuss the credit application process. These RPL application form/s can be difficult to fill out, particularly Section D which requires you to "Match your experience against the published learning outcomes of the course for which you are seeking RPL". In this field, you need to describe how you have achieved each course learning outcome through your work experience. Here is an example. 4. Email the above to your Academic Advisor (patrick.kelly@rmit.edu.au) and make an appointment to discuss your application, either in person or on the phone. Course Transcript: If your application is successful, your credited courses will be listed as RLG (Recognition of Prior Learning - Granted). To check your academic record and view your credit login to myRMIT, select the link to Enrolment Online, then select Academic History.